Dr. Gagne joins the Weare Animal Hospital team after graduating from the Iowa State University College of Veterinary Medicine in 2018. She also has a Bachelor of Science degree in Animal and Veterinary Sciences from the University of Maine with minors in chemistry and microbiology. She is a member of the American Veterinary Medical Association, the Humane Society Veterinary Medical Association, and the American Association of Feline Practitioners. Dr. Gagne grew up just around the corner, in Goffstown NH. 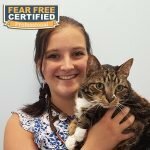 She first fell in love with veterinary medicine when she brought her own sick family pet in to the Weare Animal Hospital back in 2012, during her undergraduate career. From then on, she has spent every school vacation interning and shadowing our doctors and staff. All the reasons she fell in love with Weare Animal Hospital remain today including: the highly trained and caring staff; high caliber of medicine; positive work environment; and drive for continuous learning. Dr Gagne says Weare Animal Hospital has always been home to her, and she cannot imagine practicing anywhere else. While at Iowa State University, Dr. Gagne was heavily involved in all aspects of feline medicine. Her favorite experience was spent as Co-President of the ISU Feral Cat Alliance, which offered low cost spay/neuter, vaccinations, and physical examinations to community cats. During her time as Co-President, she assisted in a study documenting the prevalence of zoonotic infectious diseases in Central Iowa feral cats. She was also President of the ISU Student Chapter of the American Association of Feline Practitioners. Her enthusiasm for feline medicine won her the 2018 ISU Outstanding Senior Student in Feline Medicine award from the American Association of Feline Practitioners. She is very passionate about feline medicine and plans to pursue ABVP Board Certification in this field. Dr. Gagne resides in Hillsborough with her Border Collie mix Oswald, and three cats: Remington, Delilah, and Oliver. In her free time she enjoys running and hiking with her dog, snuggling with her kitties, and spending time with family. Website by Ecrane Web Design Studio.